Ideas, Inventions And Innovations : The Complete Brain Parts List Cell by Cell? The Complete Brain Parts List Cell by Cell? 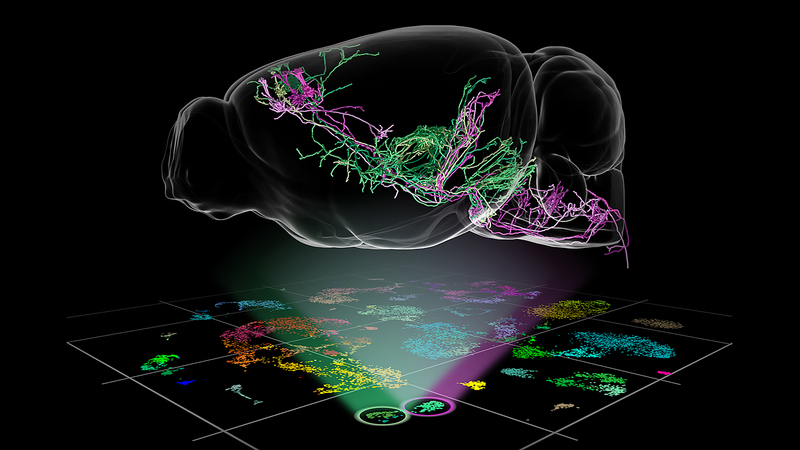 In-depth analysis sorts cells from the cerebral cortex into 133 types, lays groundwork to explore function. The cell types study was funded in part by the National Institutes of Health (grants R01EY023173 and U01MH105982). Additional authors on the cell type study include Zizhen Yao, Lucas Graybuck, Kimberly Smith, Thuc Nghi Nguyen, Darren Bertagnolli, Jeff Goldy, Emma Garren, Osnat Penn, Trygve Bakken, Jeremy Miller, Olivia Fong, Karla Hirokawa, Kanan Lathia, Christine Rimorin, Michael Tieu, Rachael Larsen, Tamara Casper, Eliza Barkan, Matthew Kroll, Sheana Parry, Nadiya Shapovalova, Daniel Hirschstein, Julie Pendergraft, Tae Kyung Kim, Aaron Szafer, Nick Dee, Peter Groblewski, Ali Cetin, Julie Harris, Boaz Levi, Susan Sunkin, Linda Madisen, Tanya Daigle, Amy Bernard, John Phillips, Ed Lein, Michael Hawrylycz, Allan Jones, and Christof Koch of the Allen Institute; Sarada Viswanathan and Loren Looger of Janelia; Vilas Menon of the Allen Institute and Janelia; and Heather Sullivan and Ian Wickersham of the Massachusetts Institute of Technology. Citation: Shared and distinct transcriptomic cell types across neocortical areas. Bosiljka Tasic, Zizhen Yao, Lucas T. Graybuck, Kimberly A. Smith, Thuc Nghi Nguyen, Darren Bertagnolli, Jeff Goldy, Emma Garren, Michael N. Economo, Sarada Viswanathan, Osnat Penn, Trygve Bakken, Vilas Menon, Jeremy Miller, Olivia Fong, Karla E. Hirokawa, Kanan Lathia, Christine Rimorin, Michael Tieu, Rachael Larsen, Tamara Casper, Eliza Barkan, Matthew Kroll, Sheana Parry, Nadiya V. Shapovalova, Daniel Hirschstein, Julie Pendergraft, Heather A. Sullivan, Tae Kyung Kim, Aaron Szafer, Nick Dee, Peter Groblewski, Ian Wickersham, Ali Cetin, Julie A. Harris, Boaz P. Levi, Susan M. Sunkin, Linda Madisen, Tanya L. Daigle, Loren Looger, Amy Bernard, John Phillips, Ed Lein, Michael Hawrylycz, Karel Svoboda, Allan R. Jones, Christof Koch, Hongkui Zeng. Nature, 2018; 563 (7729): 72 DOI: 10.1038/s41586-018-0654-5 .